While being in Asia I have come to truly grasp the importance of public transportation, but more specifically a high speed rail line. 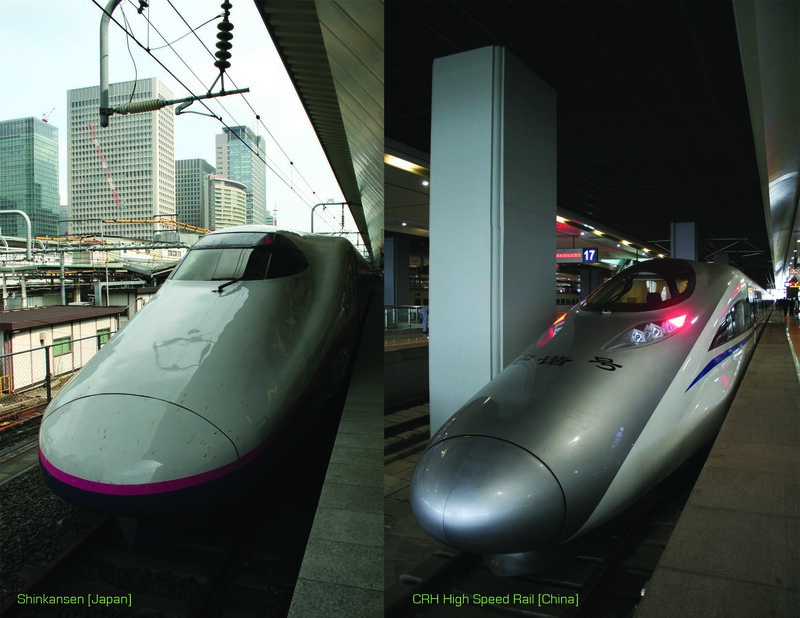 A high speed rail allows cities to densify in a healthy way. Such a rail could allow major cities to connect quick and efficiently. People could potentially live in San Jose, work in Los Angeles, and go out for the night in San Diego. This would distribute the economy, promote specialization and essentially be America’s next evolutionary step. A high speed rail line has certainly been the hot topic in US politics. Upon reading an article articulating the US’s challenges with a high speed rail, I can’t help but think Atlas Shrugged has truly foretold the American existence. In Atlas Shrugged by Ayn Rand, Dagny Taggart (the true head of a Taggart Transcontinental) fights to construct the most efficient train line to transfer people and promote industries. The world seems to be against her, claiming the speeds she purposed for the line are too dangerous, the loads too are large, and the costs are not worthy of its goals. Against all odds she gets some semblance of her original design made, by doing it on her own despite others approval. She fights against a majority who fear new ideas, progress, decisive thought, and essentially individual achievement. The success of this built line is incredible but short lived, as socialist policies are passed- capping the speed of the rail and the length of the freights, requiring equal production from all steel companies regardless of capacity, and restricting passage to certain states to equal those of its neighboring states regardless of local industries. To parallel this work of fiction, is truth. The above mentioned article quotes Transportation Secretary Ray LaHood promising to build a high speed rail in 25 years. At this, one can’t help but scoff. Twenty-five years of railway in Shanghai will produce 22 lines and about 877 km of track (the first line opened in 1995, and there are currently 12 lines and the Maglev). The Shanghai Maglev goes more than twice as fast as the proposed American line. In the US, there is actually a federal speed limit for trains on a Class 5 rail topping out at 90 mph. In fact these speeds are characteristic of trains in the 1940’s. There is also the issue of not wanting to fund replacement tracks to allow for more efficient uses. By dramatically underfunding all rail initiatives, the government is dooming any rail line to fail. If we, as Americans, create policies that limit innovation and forward movement we will be destined to live in archaic conditions. The US government is quite scarily becoming like the one in Atlas Shrugged. Which raises some very hard hitting questions about our society: have we become a nation of non-producers like the fictional America of Atlas Shrugged? Why are we afraid of the future, change, and innovation? America needs to rise up to the challenge and become the ‘can-do’ country it’s known as. This is not to say that what works for China, or even Western Europe, will work for the US. However what we are currently operating as does not work- case in point being the California debt or even national debt. For a more precise example, see Southern California. People moved inland to affordable housing, simultaneously driving up to 3 hours to get to their jobs closer to cities. Once the price of gas went up, this became improbable, and people lost their homes. A high speed rail would change all this, it could have prevented it. The irony is China, a communist country, is surpassing a ‘capitalist’ one in innovative infrastructure. This seems to debunk Rand’s philosophies and strong anti-socialist position. Or have our roles simply changed? Has America become un-American? America seems to be aligning itself with the Dr. Stadler mindset of Rand’s creation. Dr. Stadler, was once considered the leading scientific mind of the age, then denies innovation to ensure further funding of his institute. We have gone from greatness at even greater sacrifice to mediocrity that is comfortable. Has America sold out to simply keep things how they are?